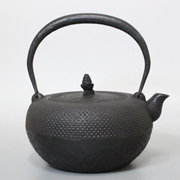 Nambu Tekki (Nambu cast iron ware) came into beiing approx. 400 years ago in the northern capital city of the Nambu clan (present day Morioka, Iwate pref.). 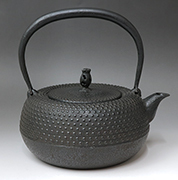 The tradition was protected by succeeding generations of Nambu feudal lords and Iwachu remains the largest producer of cast iron kitchenware in Japan today. Here we show how modern shapes based on traditional Nambu Tekki designs bridge the gap between present day needs and the grace and simplicity of the past. They are both beautiful to look at and practical to use. 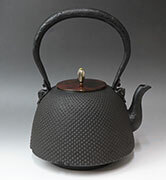 In the old days, cast iron kettles served multiple purposes in the home.They were used to boil water for household use as well as for making tea. 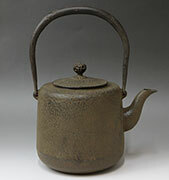 The steam from the boiling kettle was also an economical way of providing extra heat and moisture to the home in the typically cold and dry winters.It is believed that water boiled in vast iron kettles absorbs the iron, a definite plus for those who feel their diets are iron-deficient. 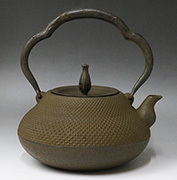 If you are a tea connoisseur who likes to experience the taste of tea brewed in various teapots made of different materials ie. 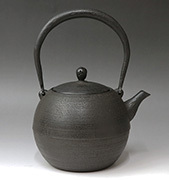 the stoneware pots of Tokoname or the porcelain pots of Arita yaki, you may prefer to use Nambu Tekki ware purely for the process of boiling water. 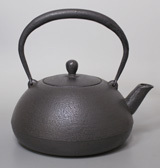 The kettles shown here do not have enamel coated interiors and are not suitable for brewing tea. 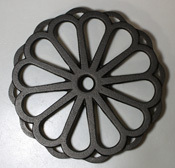 They are suitable for use over a naked flame, on gas and electric rings and have been specially treated to resist rust (although care still needs to be taken and water should not be left in the kettle). 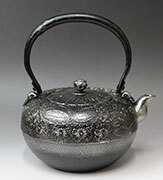 Please click on the pictures below for enlarged images of these lovely traditional pieces. 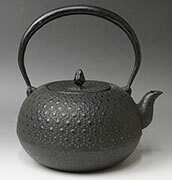 The height of each kettle is measured at the highest point of the handle. It is recommended that you fill only up to 75% of the total volume as water tends to spill over while boiling. Please bear this in mind while making your selection. 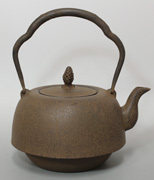 The items featured on this page are produced for the Japanese market. 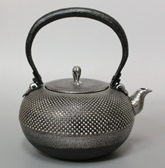 It has recently come to our attention that Nambu Tekki kettles with enamel coated interiors are being made for the export market. 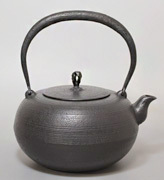 This has the advantage of improving rust resistancy, however it can also be argued that that water boiled in an uncoated kettle has a much softer taste. 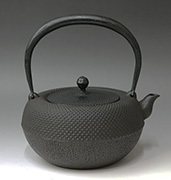 All the kettles shown in this section are handcrafted in Japan. 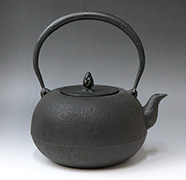 Sorry many tetsubin are currently out of stock. 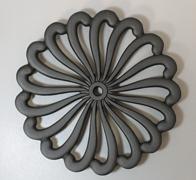 As every item is handcrafted, we only receive 1-2 styles in small quantities at a time. It can take between 6-12 months for us to restock items. If you would like to reserve a particular model, please e-mail us.